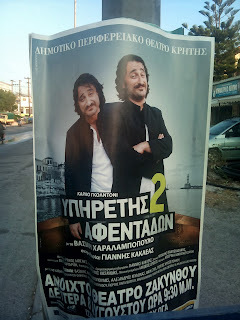 Oceanic Bar - Kalamaki - Zante: Who ate all the pies? This fat git! Has a week gone by already, time is flying now and soon i'll be back in good old blighty watching cities burn, shop windows get smashed and rain, rain and oh yes more rain. Aren't you just proud to be british, a nation of great weather and friendly people all happy to just get along and help each other, thats if getting a 42" tv out of currys shop window is involved LOL. 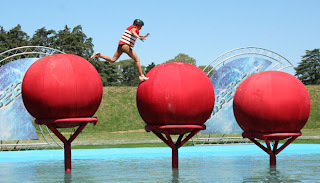 Well lets start with some very exciting news, if you remember back in March or April i applied to be on the game show "Total Wipeout" well guess what, after 4 months of waiting i have got through to the auditions to be on the show. The e-mail was recieved yesterday. Woohoo. This is part of what the e-mail said "Only a select few out of the thousands of applications have been invited for an audition, congratulations because your one of them" OH MY GOD, im one of them, can you believe it. A once in a lifetime chance to have a go at the Eliminator and the "Big Red Balls" but there is a down side to this, the audition is Sept 9th in Cardiff. I don't believe it, as Victor Meldrew would say haha. I will have to close the bar for 3 nights and fly back Thur to Sun. I will never get this opportunity again, i could apply again another year but who would say that i will be successful the next time, i so want to do the audition and hopefully be accepted for the show. Also its filmed in Argentina, AREEBA AREEBA, i know thats more to do with Mexico but what do the Argentinians say when excited? Are you behind me folks? Answers on a postcard or on the Oceanic chill out bar facebook wall. This could be me flying through the air gracefully then finishing with a big fat splash! So i've got pretty fed up with white pudding now but still munching my way through it, 5 left to go. So i decided to get some good old stodge, pies, pasties, sausages and fish cakes. I went to one of the large supermarkets out of town and bought 4 chicken and veg pies, 4 cod cakes, 2 cornish pasties, a steak and kidney pudding and a bag of 8 pork sausages. I'm not proud of myself to tell you this but i ate all of them in 2 days, well except 4 sausages which are still in the freezer. So i will now review the food. 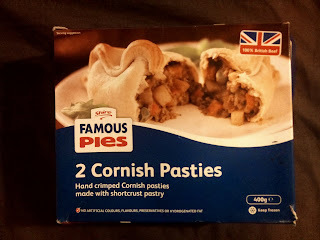 First the cornish pasties, as you can see from the picture the name of the brand is "Shire Famous Pies"? Yep i've never heard of them either. So of course i was expecting them to be more "Shite Famous Pies" but i was very surprised they were lovely, filled well, good meat and nice tasting veg. The Cod Cakes, well they were made by "Youngs" so of course they were great. The Chicken & Veg pies this time Birds Eye, they were ok, shallow filling, processed chicken and mainly gravy, poor. 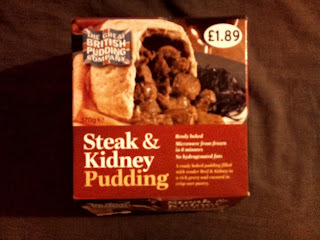 Now then, the steak & kidney pudding by "The Great British Pudding Company" again, WHO? The box said on it "Made with the finest cuts of meat", finest cuts of meat for who, Lassie! I cut it open like the picture on the box, looked promising, good pastry, filled well. Then the taste, what the hell kind of meat are they using, the last time i smelt and saw meat that looked like that it was in Petras dog bowl (Petra being my mums dog of course) and even she turned her nose up at it. As you can see from the box its £1.89, to be honest i doubt these are even sold in the UK and are sold to foreign countries for idiot brits like me to buy and it cost me 4.25€, bloody hell all that white pudding must have made me desperate for me to pay that much LOL. Talking of things that make you chuckle, well it made me laugh with sarcasm, what has happened with the british charts, Cher "x factor loser" Lloyd is at number 1. Now i hadn't heard the song till just now but isnt the chorus "Oh my darling Clementine"?, talk about major rip off. No wonder the music industry is in a state with crap like that getting to number 1. The bar is doing amazing but the nights are very weird. Since the 1st Aug including last night i've been packed out at some point having to put chain across, Maybe not for long but still packed out. Which is good but also not so good as customers are being turned away but i can't fit in any more than the floor space allows but the drinking habits are strange. One minute i'm there chatting with just maybe 2 tables of customers thinking its going to be a quiet night then, boom! About 9.30-10pm the bar packs out then all gone again by 11.30am and closing by 2am. Now for me thats fine, i'm hitting 2-3 times my target in a short space of time and getting to close early which in this heat is a god send as i'm just drained all the time. At the moment i'm ahead of my best month ever but i never take anything for granted it can all change within a matter of 1 day but i've paid up full the rent on the bar and the apartment for the season so from here on in it should be stress free, famous last words haha! Around the resort its starting to get quieter now so i'm told but on the old road as the people are walking past my bar i hear hardly any british voices these days, all eastern european, greek and italian. Where as before Kalamaki was maybe 80% british i would definately say its now only 50%. My thoughts are its down to the UK tour companies squeezing the hoteliers profit margins so the hoteliers go with foreign tour companies who pay more per room. Don't blame them to be honest they need to make a living. Well my ramblings are coming to an end and the X Box is calling, i'm now middleweight champion of the world on Fight Night, "floats like a butterfly and stings like a bee, i am the greatest", "touch gloves and lets get it on" i'm out of here folks.